Paper Plane Design Blog. - Paper Plane Design Blog// Homepage. Ian Phillips from Gartec, has written the latest piece for the blog orientated around the benefits of luxury platform lifts within the modern home. It's a very interesting read over an area which is arguably overlooked within domestic design. These days the idea of modern living is largely driven by luxury and convenience. Having fewer chores to attend to and having the ability to fully relax in your domain, without domestic difficulties, makes us much happier and more comfortable in our homes. Take dishwashing as an example - how would many of us cope nowadays without the use of a domestic dishwasher? Since the introduction of these genius devices into the domestic market, relationships between stacked plates and over-flowing sinks have gradually faded and thankfully so! Getting your hands wet whilst cleaning your dirty cutlery is just not luxurious, is it? Swimming pools, hot-tubs, grand fireplaces and motion controlled televisions are all convenient luxury items most of us would love to own. They add a touch of class and grandeur to your home, enabling you to relax in style and impress your friends. Unfortunately though, most items under this category are usually too expensive for the average individual or family; meaning the majority of us will go without. This isn’t the end of the world of course, these things we can all live without; but I’m sure we’d all prefer to live with! Nevertheless there is a product on the market that many of us may not have thought about before; one that is affordable, luxurious and slowly creeping into modern interior design across the country. Over the last 5-10 years or so, the use of platform lifts within the home has grown more and more popular. With almost limitless possibilities on how you can customise a home lift, it’s easier than ever to adopt and match-up this luxury equipment with your existing interior design. I myself have a vacuum lift installed in my home to help with my disabled son’s portability requirements; but since its arrival our staircase is relatively redundant as the whole family makes use of the lift instead! Making life easier: The installation of a simple platform lift can make your living standards much easier and much more relaxed. Avoiding the use of stairs can be particularly beneficial to those with medical problems or sufferers of back pain, joint pain and/or arthritis. My family are able to move around my home, switching between floors, in ease and relative comfort; allowing us all to be more relaxed in our home environment. On the rise: The use of lifts within the home is becoming increasingly popular as time goes on, meaning they are no longer considered a top-end luxury item reserved only for the rich. 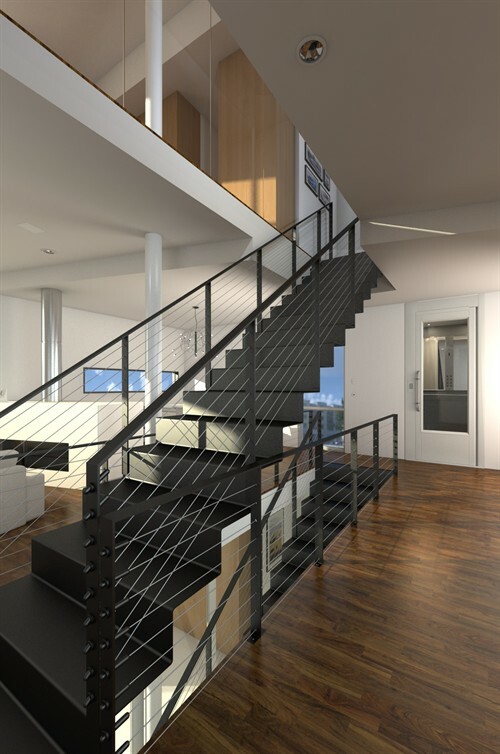 Nowadays, the variable design and implementation options that come with platform lifts have made them more appealing to the residential market and they are quickly becoming commonplace. Who knows, in a few more years, maybe they’ll become as indispensable as the dishwasher! Affordable: Residential lifts are not only affordable, but they add significant value to a property too. Despite being considered a luxury item at present, you can usually find a basic model for less than the amount of money you’d pay for a standard family car. I certainly found this to be true! Considering the amount of value a lift will add to your home, plus the medical and domestic benefits they provide, you can certainly judge this as a wise investment. 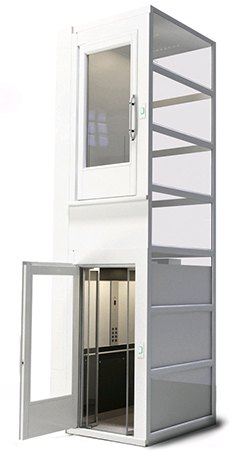 Design options: Platform lifts do not come in a one-size-fits-all arrangement, nor do they have to look bland and mechanical like your average commercial lift. You have as much design options with these devices as you would do with any other piece of furniture within your home. With a range of styles, finishes and interior decoration to choose from, a platform lift will nestle quite comfortably in any home’s décor. A big thanks to Ian for such an interesting insight into the world of domestic lifts! half a fleet fox and some blokes with beards. Unbeknownst to myself I found out today, whilst searching through Sub Pop Records's catalogue, that Christian and Casey from Fleet Foxes's have a side project called Poor Moon. This particular song 'Holiday' is typically melodic with hints of that Gregorian chant sound that has become so synonymous with Fleet Foxes. The music makes you feel like you have been transported to a 60's TV commercial for an American Airline advertising holidays in Hawaii. The video is equally as tranquil, following a limber old gent who is taking a vacation in a mental institute and is very much enjoying a bit of a dance with the inmates. For myself I like these unannounced findings of superbious music, and tend to find that Sub Pop Records has a lot similar to offer. My only hope now is that you like it also. 'Design Icons' by John Lewis. Have you ever wanted a one stop place where you can view iconic Design classics without having to individually trawl through each manufacturers websites? Well fear not, thanks to John Lewis you can now scroll through an interactive info graphic which covers iconic pieces of timeless Design over the past 70 years. Information regarding the pieces/Designers is available by clicking on the image and if you really like what you see and fancy purchasing a piece of Design History, then you can always purchase through John Lewis by clicking on the link above. Have a scroll below and enjoy! From finland with Fabrics. Ada & Ina. MODERN OFFICE IN AN INDUSTRIAL BUILDING. After a long break from the blogging world, I was recently contacted by Soile Makkonen of Ada and Ina, who specialise in domestic upholstery and curtain fabrics. I was immediately inspired by their diverse range of colour and pattern choice. It was also great to see the recent pictures of their new office situated at Logomo in Turku. Logomo is a premise for creative entrepreneurs and has a footprint of over 5000 sqm. The building is steeped in history and in a previous life was a machine factory back in the 1800s. 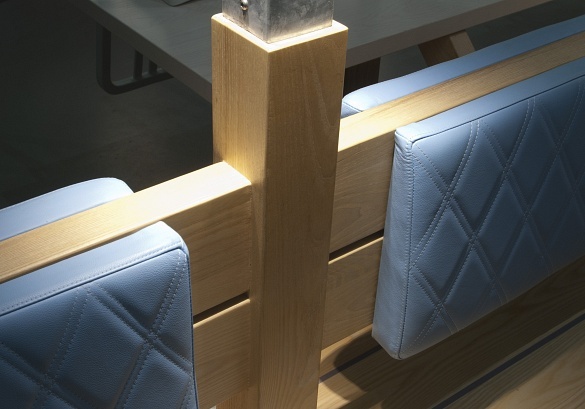 These industrial characters form the basis for the quirky accessories within the breakout and communal eating areas. Staying true to its roots. Industrial light pendants that look worn down and as old as the building itself add character to the backdrop of modern surfaces and materials. Old shipping crates create tables and where possible the existing brickwork is kept on show, albeit painted but again this pays homage to the charm and nostalgia within the building. It's great to see a building such as this re-used and re-imagined for another purpose and there seems to be a success especially with buildings that once had an Industrial past. Having previously worked in a similar location, it was almost like going to work in somewhere out of a history book. WANT to find out more about ada & ina? Ada & Ina are UK based with their sales offices being in Finland. They have a wide range of colour options and fabrics for both curtain use and light upholstery. Minimum orders are usually 3m but they also offer a fantastic sample service which is great for both Interior Designers and home enthusiasts. Please follow the link below to view their complete range. Eco-Friendly Song by Let's Use Teamwork. It's been a while since I've posted due to a busy schedule, but eco-month will be extended to give it justice! To keep you guys salivating for more, have a listen to this trio (plus special guests) from Kansas City. A happy clap along song if there ever was one! It has elements of Beck in there but fresher, more current and it sounds like music should do, fun, enjoyable and easy on the ears! 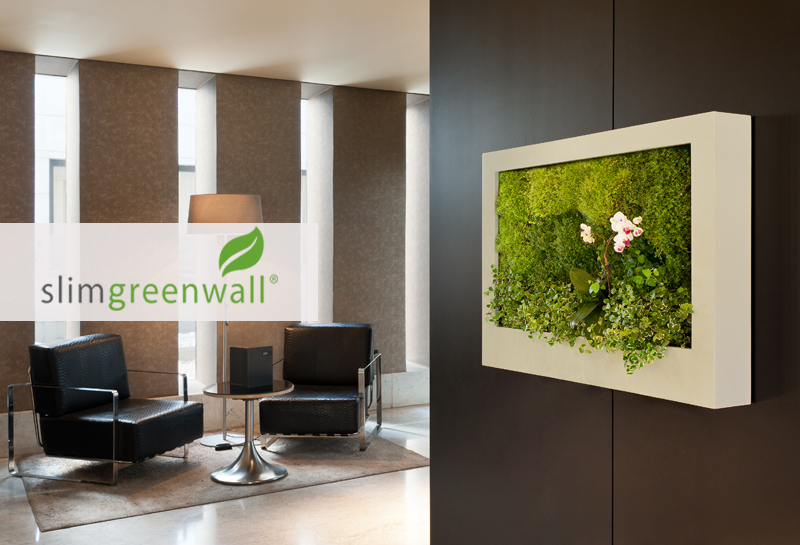 Slimgreenwall- Hassle Free Interior Living Walls. I was recently contacted by Terapia Urbana who are committed to developing urban greening tools and solutions to ease the effects of global warming, inefficient energy consumption and excessive CO2 emissions that many of our cities now face. 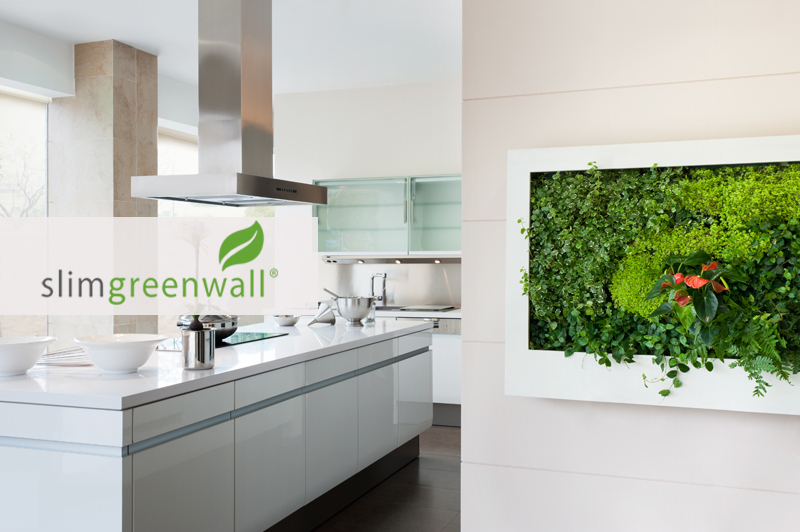 The one particular product I am very interested in is the slimgreenwall which is a hassle free living Interior wall. How does it work? Well it purifies the air by recycling excessive Co2 in the atmosphere, creates a barrier for sound pollution, and with the excess carbon dioxide out of the office air, it increases productivity and happiness. What I like about this product is that it isn't just some conceptual idea, a pipe dream created by some idealistic designers, it is fully functioning, operational and available to purchase in the UK through Scotscape. 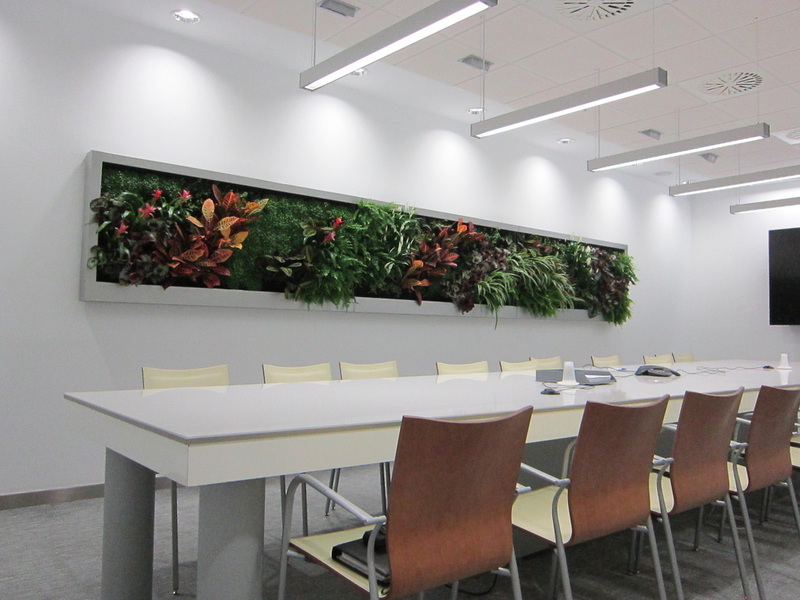 The image above is the product at the Ayesa Advanced Technologies Office in Seville, Spain. How great does it look fixed onto that neutral wall! That's all well and good I hear you say, but it must take ages to clean and maintain? Well in fact no, it is self sufficient, self cleaning and has automatic irrigation all included. 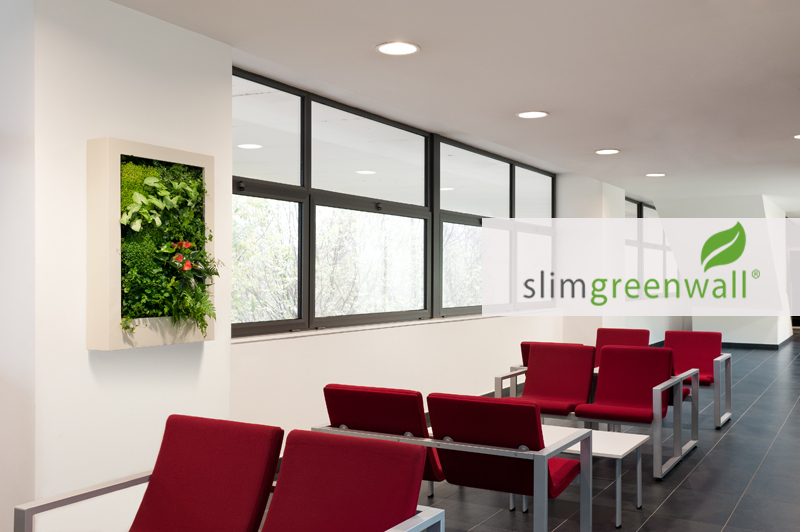 Just install and reap the benefits of cleaner air in your home, office or any space you deem imaginable. In a world where the word 'eco' has become a gimmick and nonchalantly used in everyday speak, it is great to see a product which is feasible, believable and beneficial to everyday people in everyday Interiors. 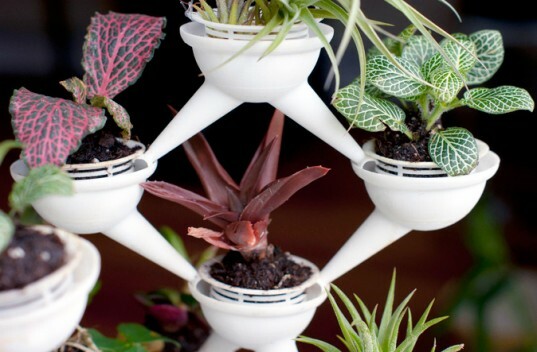 3D Printed Aqueduct Planters by Shapeways. Carbon Footprint, recycling, clean air, hybrid, eco, green and sustainable are all words that are frighteningly over used in today's society. Corporations have made us believe that we live in a green world, with clean oxygenated air and packets that biodegrade instantly in one of the many bins the local council now provides. I want to sift through the marketing and PR bulls*** that we are subjected to on a daily basis and focus on products that are truly making a difference to the world we live in. Open your mind and your lungs and breath in that slightly less polluted city air. 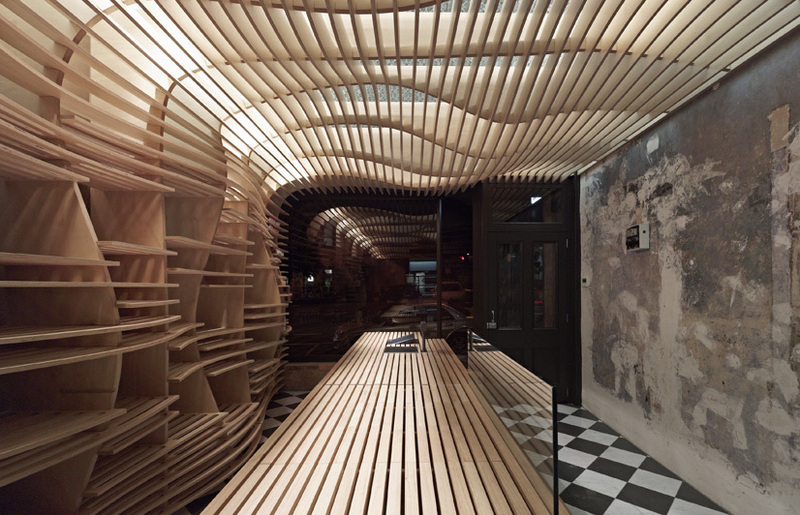 For the Love of Slats. In Melbourne Australia lives a slatted dream. 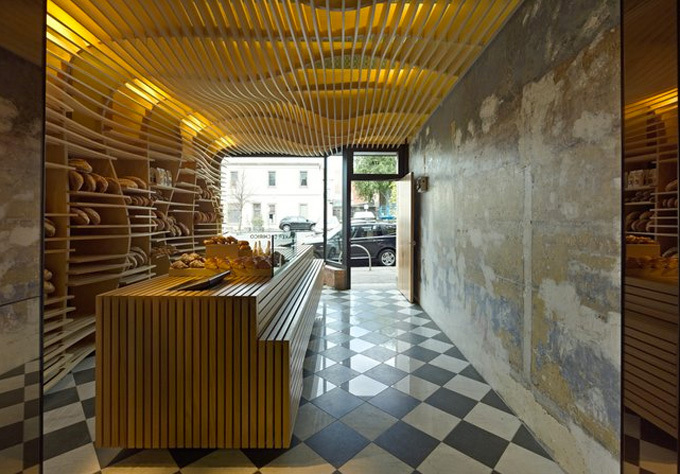 Baker D. Chirico is an undulating cacophony of veneered ply, shadow-play and worn down surfaces. Put simply, I really admire this Interior. The possibilities are endless with a beautifully detailed cross jointed timber monolith. You can undulate and stagger the spans to create definition with parallel lines which equally act not only for aesthetic purposes, but as guides to a point of interest within that space. From the street view the large glazed window acts like a frame and subtly encases the luxurious and intriguing art of the Interior. The clever use of back-lit lighting not only creates shadow effects but also an angelic glow that enhances the fine detail of the wood grain. What a way to end a month dedicated to bakeries! 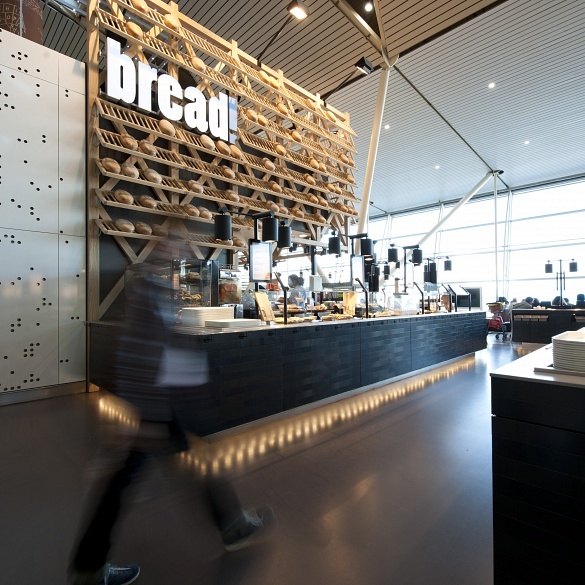 Dutch Design Studio Tjep have created a series of innovative stores for Terminal 3 at Schipol Airport. A Flower Shop that 'lifts up' a Cheese shop and a very on topic Bread shop. Bread! 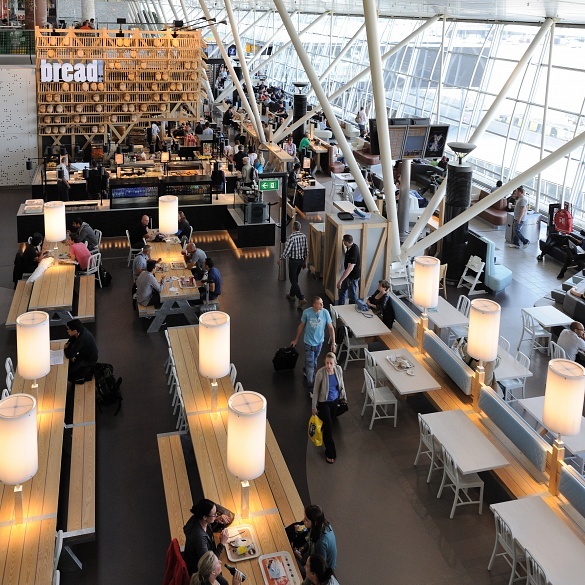 Brings the artisan bakery to the masses within one of Europe's busiest airports. 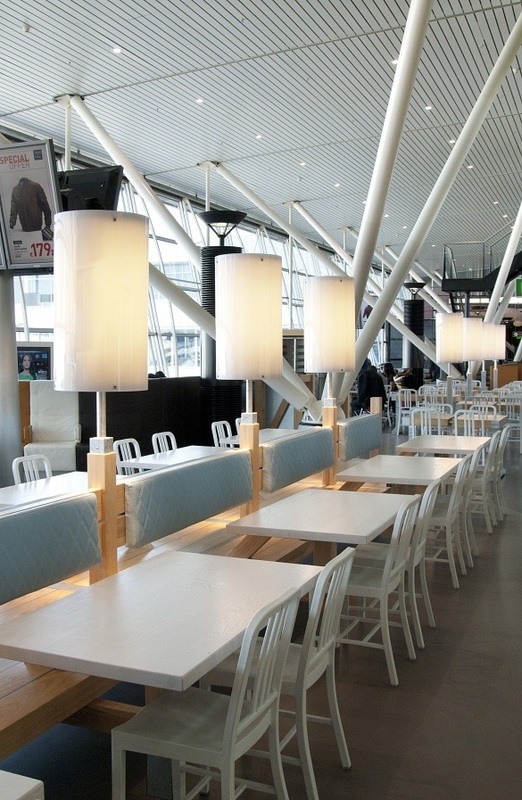 According to Tjep, the Design was inspired by the Interiors of the iconic Dutch Windmills. 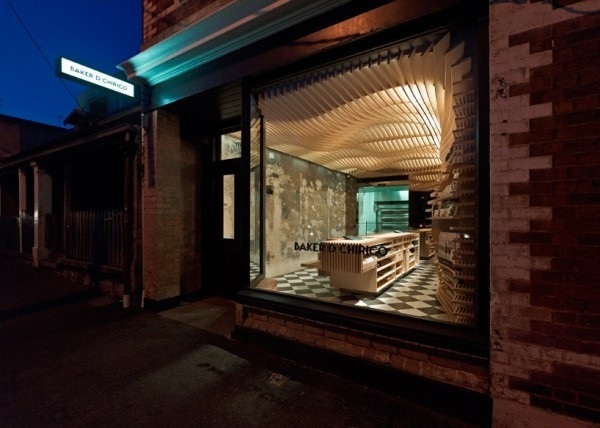 You can see that definitely in the slatted timber battens that create display units for the freshly baked bread. As well as a eye catching servery area, there is a rather large dining area where this simple and contemporary style is further rolled out. The white unassuming side chairs that resemble a modern take on the chairs seen in the Shaker movement, match elegantly with the Ash finish of the bench seating and the grey quilted seat pads. Put simply this is a beautiful Interior that pays homage to Design. It is detailed beautifully for an area of mass footfall and the consideration of material finish, style and colour is superb. However I expect nothing less of Dutch Design, they just get it, understand it completely and aren't afraid of taking a risk with going ahead with an achievable concept. In one of the worlds most finest cities (Amsterdam) this is just one tiny granule of a whole plethora of fine Design examples.